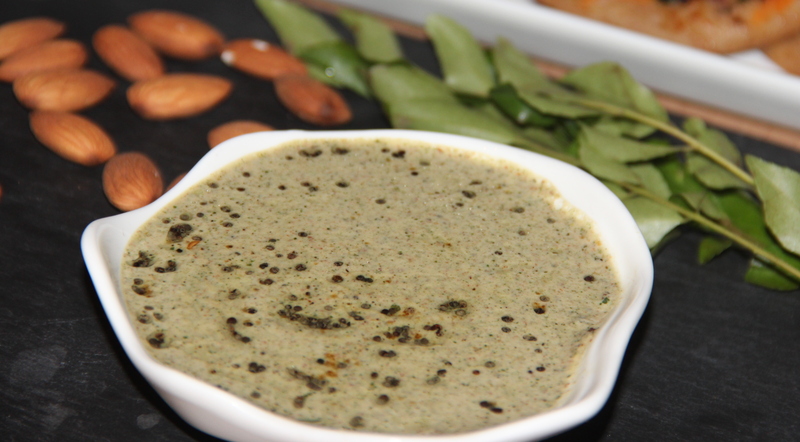 Curry leaves chutney/pesto is a healthy flavourful dip which can be an accompaniment. In south india curry leaves dip is a blend of curry leaves, coconut/onion with spices. I here used almonds as a variation and tried to make this as a pesto/dip. So this can be an accompaniment with south indian break fast like Idli / Dosa and can also be used as a spread on toast and sandwiches. I served this with Tomato instant dosa (link). Curry leaves are natural flavoring agents with a number of important health benefits, which makes your food both healthy and tasty along with pleasing aroma. They contain various antioxidant properties and have the ability to control diarrhea, gastrointestinal problems such as indigestion, excessive acid secretion, peptic ulcers, dysentery, diabetes and an unhealthy cholesterol balance. They are also believed to have cancer fighting properties and are known to help protect the liver. Posted on September 10, 2014, in Dips, Indian. Bookmark the permalink. 26 Comments.